Just before the end of the 1990-1991 Gulf War, more than 700 wells in Kuwaiti oil fields were set on fire. Several international companies and scientific organisations were involved in extinguishing the fires and in assessing the impact of this major environmental incursion. 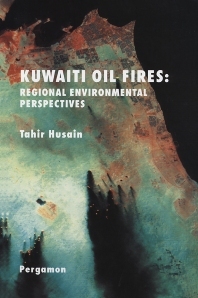 Kuwaiti Oil Fires: Regional Environmental Perspectives summarises these effects. The topics covered include the application of remote sensing techniques to determine the location of wells on fire and plume movement; air quality and particulate monitoring by ground stations and aircraft measurements; organic and inorganic constituents in the air; use of modeling techniques to study dispersion characteristics of pollutants and deposition of soot; and the efforts by the fire fighters in extinguishing fires and capping the wells. A brief overview of the causes of the crisis and the role of regional and international groups in resolving the dispute is presented as well as some basic and useful statistics of the region covering general information on economic aspects and exploitation of oil resources in both Iraq and Kuwait. Problems faced by the fire fighting teams, the preparations made to overcome the problems, and technology used in extinguishing the well fires are also discussed. Numerous colour photographs are used to illustrate the problems encountered and the techniques involved in their solution. Petroleum engineers, environmental scientists/engineers, air quality scientists/engineers, ecologists, environmental modelers, undergraduate and graduate students in environmental science and engineering, national and international regulatory bodies, disaster contingency planners. Economic Development and Oil Exploration in Kuwait and Iraq. Background information - Kuwait. Oil development in Kuwait. General background - Iraq. Historical development of oil fields in Iraq. The Gulf Environmental Crisis: Preparations, Predictions and Warning. Background of the Gulf crisis. Early prediction of environmental catastrophe. Extinguishing Kuwaiti Oil Fires. Smoke plumes from Kuwaiti oil wells. Fire extinguishing methods. Source Estimates. Application of remote sensing technique. Smoke Plume Characterization. Smoke plume - physical characterization. Smoke plume - chemical characterization. Air Quality Monitoring. Air quality standards. Concentration of gaseous pollutants before and during the Kuwaiti oil fires. Particulate Monitoring. Particulate monitoring in Kuwait. Organic and inorganic constituents in particulate. Modeling Approach. Models used during Kuwaiti oil fires. Environmental Impact Assessment. Impact on human health. Impact on weather. Major Episodes - Lessons Learned and the Future. Future emergency response. 32 Colour Illustrations.